The standard Gems 1 violin is set up with Thomastik Dominant strings and a standard tailpiece with one fine tuner. To change these settings, use the options at the top of the page. To select a case and a bow go to the top left menu and choose these items independently, or you can use these links for a 1/4 violin case and a 1/4 violin bow. All items will be shipped at once, in the same package. Each Gems 1 instrument is accompanied by a certificate of quality, which confirms that the instrument meets all the design, manufacturing, finishing, and set up requirements that define the Gems 1 Workshop - Advanced Student level. The antique finish does not affect the sound of the instruments; it is just a matter of visual beauty. The instruments finished in an antique style have an "old" feel and the color is not uniform along the body, trying to replicate the looks of a violin that was subject to the passage of time. - Solid Carpathian Resonance Spruce (Latin name: Picea Abies (L) Karst) - used for the top plate of the instrument, the bass bar, the blocks, the corner-blocks, the linings, and the sound post. - Solid Carpathian Flamed Mountain Maple (Latin name: Acer Pseudoplatanus L.) - used for the back plate of the instruments, the neck, the scroll, the peg box, the ribs, the bridge, and sometimes the accessories. - Ebony (Latin name: Diospyros sp.) - used for the accessories: fingerboard, pegs, top nut, purfling, chinrest, tailpiece, the saddle, and the end pin. All orders will be processed immediately and shipped out to you within 24 hours. Orders received on Friday or over the weekend will be mailed out on Monday. The violin will be shipped from our office in Vancouver, BC. All our instruments come with a 7-day trial period. The trial period begins on the day of delivery. You may return all items you purchased within 7 days of delivery. A refund will be processed promptly, as soon as the items reach our office in Vancouver. The items must be in the same condition in which they were when received. 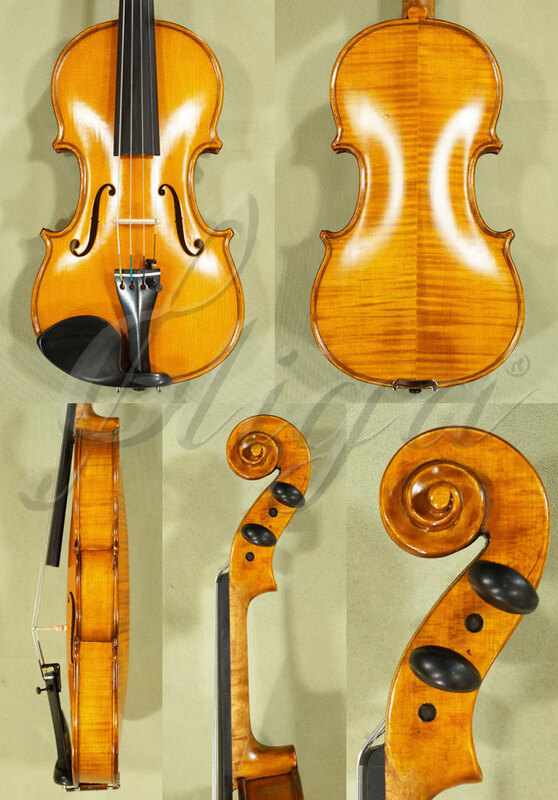 Click the button below to add the 1/4 Gems 1 Intermediate Level Violin - Antique Finish - Code C2487V to your wish list.